Rome wasn’t built in a day and long-term team projects aren’t either. Improve your team project management capabilities with subtasks in Hibox. Behind every final product, there are plenty of small tasks and failing to complete them can throw off deadlines and quality. And, honestly, it feels good to cross the little things off your list! Having a few little ‘wins’ on the way to accomplishing a large goal keeps up the motivation. This is perfect for a project with multiple parts, drafts, and due dates to check off. Your whole team will be able to see the details of how far along you’ve come and exactly what needs to be done next. You can assign different users to each subtask for projects that are more collaborative and assign individual due dates. When you complete a subtask and close it out, the main task won’t go anywhere. You’ll just have a better idea of what’s left! Just watching that subtask getting crossed off was fulfilling. 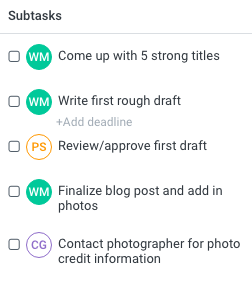 Make your project management more effective starting from today with our subtasks feature! Get to tackling that daunting project with your team now in Hibox.